Kozuma (or as he is better known, Kuwabara)'s personality is ambiguous and at times inconsistent. One minute he is brawling on the streets, the next he is down on his knees begging for the safety of his kitten. Though he is exceedingly strong, he is the team's weak link. He is at times head-on stubborn, refusing to back down from a fight or even realize his odds of losing. He can be prone to infatuation with good-looking girls, often to a comical extent. 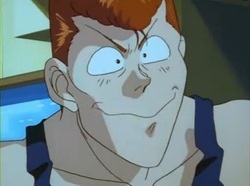 But above all, Kuwabara is incomprehensibly honorable and holds utter disgust for dishonorable people.